Joshua Pollack on North Korea’s ever-evolving nuclear weapons program, and the U.S. response. Starting in May 2016, Consensus Net and The Diplomat will be conducting a series of joint interviews. We work together to formulate questions to be put to distinguished scholars in the United States and China, then provide the interviews in both English and Chinese. A Chinese-language version of this interview will be available in the June issue of Leaders, Consensus Net‘s affiliated magazine. For this first joint entry in this series, The Diplomat interviewed Joshua Pollack, editor of The Nonproliferation Review and a leading expert on nuclear and missile proliferation, about North Korea’s nuclear program, the international response, and where to go from here. Despite all the Security Council resolutions and sanctions on North Korea, nothing so far has prevented the North from conducting nuclear tests and launching missiles. Why hasn’t North Korea given up on developing nuclear weapons? North Korea – through its ruling Korean Workers’ Party and the National Defense Commission that guides affairs of state – has declared repeatedly that it sees itself as an “independent” state without any true allies or protectors, compelled to live by the sword in an unjust world where only strength permits survival. Tests of nuclear weapons and delivery vehicles demonstrate that strength. 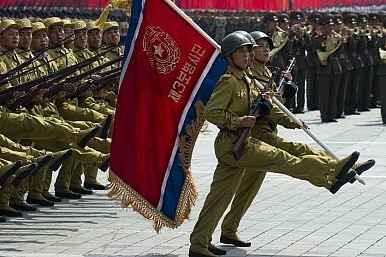 They also assert North Korean pride. After the fourth nuclear test, in January 2016, which official media described as the first thermonuclear test, a “government statement” declared that the DPRK had accordingly entered “the front rank” of nuclear-armed states. By dint of these technological milestones, they are demanding to be treated as equals by countries such as China, the United States, and Russia. Do you think the latest round of sanctions will be any more effective than previous rounds? How do we measure the effectiveness of sanctions? We could think about this question in at least three ways: by how much pressure we think they put on North Korean decision-makers; by how much we believe they alter North Korean behavior; and by how difficult they make it for North Korea to acquire sensitive technologies. It’s hard to be sure how much pressure sanctions create. The North Koreans are likely to find ways over time to adapt to new sanctions, at least partly. The record on behavior is not encouraging; North Korea frames its defiant tests of nuclear weapons as ways of responding to international condemnation, although it is probably more accurate to say that they have found acts of condemnation to be a useful pretext for tests. There isn’t much evidence so far that strengthening sanctions has compelled them to moderate their behavior. I do suspect that they softened some of their rhetoric on China after the adoption of UNSCR 2270 earlier this year in order to avoid provoking the strictest sort of sanctions enforcement. The picture on sensitive technologies is somewhat discouraging. There are a variety of data points that give us insight into how much progress the North Koreans have made on indigenizing their WMD and missile programs. They appear to be further along than most observers realize. But considering that they still do import goods we would like to deny them, greater international awareness of Security Council resolutions and stronger enforcement of export controls would make a difference. That’s been the case at least since the adoption of UNSCR 1718 in 2006 and remains so today. In the meantime, if we’re looking for recent indicators of Pyongyang’s overall thinking on these questions, I would point to two developments in the first half of 2016. First is the prominence of a new motto, “self-development.” It may emerge as Kim Jong-un’s signature contribution to Party ideology. It means that North Korea plans to build up its military and economic strength without aid from others. Second are displays of advanced production technology. Along with new missiles, a new missile nosecone, and a nuclear weapon, we’ve been shown a bunch of new machine tools and industrial robots. The message seems to be that they can make (or import) whatever they truly need for high-priority programs. Going by these signals, at least, Kim Jong-un seems to be telling the world that he has no plans to change course. How would you evaluate the Obama administration’s North Korea policy so far? With Obama and his team having less than a year left in office, is there any hope for additional progress on the nuclear issue? Despite a couple of probes, it would be fair to say that Obama administration made an early strategic choice to focus its attention on getting the Iranian nuclear program under control. It put North Korea to one side, waiting to see if thinking in Pyongyang would change. The administration appears to have gotten the desired results with Iran. Judging by what’s been in the U.S. media since then, they’ve probably made a more concerted effort to talk with Pakistan about the direction of its nuclear program than they have with North Korea. Under the circumstances, we shouldn’t rush to criticize the choice of not making nuclear diplomacy with North Korea the highest priority. There good reasons to believe that the North had no intention of turning back after its first nuclear test in 2006. The chances of achieving an enduring success in diplomacy with North Korea are uncertain at best, while the political costs of making the attempt are considerable. So I see few reasons to anticipate any fresh approach during the rest of 2016. Nonetheless, the result of putting North Korean on a diplomatic back burner has been more nuclear tests and missile tests. North Korea’s strategic capabilities are more advanced than in 2009, and its nuclear and missile programs aren’t noticeably slowing down. The U.S. is helping South Korea to deploy the Terminal High Altitude Area Defense system, and hasn’t responded positively to China’s suggestion to pursue a “dual track” approach to negotiations over denuclearization and a peace treaty to formally end the Korean War. Some Chinese scholars have concluded that America’s North Korea policy constantly ignores China’s interests. How would you respond? The U.S. is negotiating with Seoul for permission to deploy THAAD to South Korea to create a “layered defense” for U.S. Forces Korea, which already has Patriot BMD systems. That means that the defending side would get more than one shot at an inbound North Korean warhead, if needed: first with THAAD, then with Patriot. Today, USFK’s defensive systems are separate from South Korea’s, an arrangement that looks far from optimal. Beijing seems to see THAAD deployment as part of a process of converging U.S. and South Korean missile defense systems into something that would resemble the tightly integrated U.S.-Japanese defense architecture. If Chinese leaders find that idea so objectionable, then it could be argued that they are defining their security interests in Korea in a zero-sum manner against the interests of the U.S.-South Korean alliance. Under the circumstances, it would be difficult for the United States and South Korea to accommodate Chinese interests. Taking into account North Korea’s progress in its nuclear and missile programs over the past decades, is it still possible to envision a non-nuclear Korean Peninsula? At what point does North Korea cross the threshold and become a permanent nuclear state, whether or not the world acknowledges it? The North Koreans have recently indicated that they are willing to refrain from additional nuclear tests in the absence of the annual U.S.-South Korean joint exercises. But they have also indicated that their September 19, 2005, commitment to denuclearization is a dead letter. If they persist in these positions, then the most that would be possible is some version of a freeze. That sort of goal might be worth pursuing in the near term, on an interim basis. The long term is harder to predict. It’s certainly a fair bet that Pyongyang believes today that it can, must, and will remain in possession of nuclear weapons, and will continue to do so for as long as it sees them as the key to its security and the ultimate expression of national power and pride. American scholars and officials are not enthusiastic about resuming the six party talks. However, since the talks were shut down, North Korea has conducted three nuclear tests. It seems halting negotiations with North Korea has not been helpful. Does the U.S. have a better proposal to solve the nuclear issue? The next administration will have the opportunity to weigh the advantages and disadvantages of pursuing a renewed freeze of North Korea’s nuclear tests, missile tests, space launches, and operation of fuel-cycle facilities. The strongest objection to this idea is that the North Koreans could agree to such a freeze, pocket whatever aid they may have garnered in the process, and then drop the freeze whenever they feel ready to do so. Convincingly overcoming this objection will take some hard thinking about how far we are prepared to go in offering the North Koreans gains that they actually value enough to accept long-term constraints on strategic programs. These gains would have to be “retractable” by design, so Pyongyang would not be tempted to try to have it both ways. This would be a difficult test to meet, but perhaps it can be done. It’s certainly not in the interests of the United States or its allies to let North Korea’s nuclear and missile programs continue unchecked, and sanctions alone haven’t done the job.